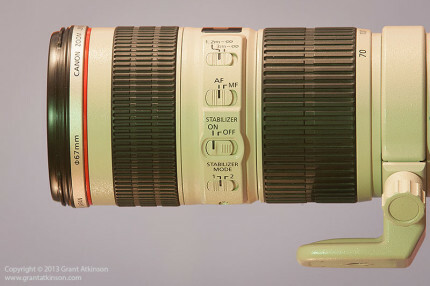 The Canon EF 70-200 f4 L IS is both a highly-regarded and successful telephoto zoom lens which was first introduced late in 2006. Today it is no longer a new lens as such in the line-up but it is still current. When it was released it supplemented rather than replaced the older, non image-stabilized EF 70-200 L f4, which is a lens that is also still available. The two lenses are similar in size and shape, but there is significant difference when it comes to their design and specification. Starting on the outside, the metal body is well-constructed, and the lens benefits from weather-sealing design changes, compared to the non-IS version. The lens mount is standard Canon EOS, complete with the weather-sealing rubber ring. The base of the lens barrel is ridged, to help provide a secure grip when adding or removing a camera body. The lens is not supplied with a tripod ring as standard, but I have bought Tripod Mount A II (W) as an accessory. The ring has a black stripe that marks its vertical alignment with the lens, and a knurled locking knob. Unscrewing the spring-loaded locking knob to completely loosen it allows the tripod ring to be removed from the lens, whether a camera body is mounted or not. The zoom ring is wide, made of rubber and is broadly textured. There is a focus distance scale on the top of the lens barrel. On the side is a panel that houses the switches for controlling AF/MF, focus distance and the image stabilization is of the newer Canon design, being effective at compensating for 4-stops. Aside from being bigger to accommodate the extra switches needed for the IS, a really positive improvement is the way that the switches have been recessed within the housing. On the non-IS lens, it is very easy to accidentally bump one of the switches onto an unintended setting. The switches on the newer lens are tucked-in, and require deliberate pressure to move them, which is how it should be. The EF 70-200 f4 L IS was the first white Canon lens to feature these new, accident-proof switches. The switches control focus distance, focus mode and image stabilization. This is one of the first Canon lenses to be fitted with a 4-stop image stabilizer system. The focus ring is also made of rubber, with a finer texture to its ribbing than the zoom ring, which helps to differentiate the two controls by feel. The front lens element and filter thread are 67mm in diameter. The lens is also supplied with two end caps, one for the lens mount and the other a 67mm squeeze-on type. A black plastic lens hood, ET 74 is supplied with the lens. It is of the type that turns on and clicks lightly into place. So far this lens hood is not showing any sign of becoming loose and wobbly in its attachment. Some of the older Canon lens hoods had a tendency to do that, in particular those found on the EF 100-400L and the old EF 70-200L f2.8 IS. The inside of the lens hood is covered in non-reflective flocking, which helps prevent any stray light rays from being reflected onto the front lens element. All moving parts are inside the lens barrel, and it does not change size or shape when zooming or focusing. This type of design is usually better at keeping out dust and moisture than a telescoping design. The lens is also weather-sealed, which means that it is drip-proof, and dust resistant. It does need to be paired with a suitably weather-sealed Canon body to realize this level of specification. The EF 70-200 L f4 feels very well built, and should last a long time. There are a number of important differences inside the lens barrel, compared to the non-IS EF 70-200L f4. Some lens elements feature Super Spectra coatings, which reduce flare and ghosting, and specifically improve image quality with digital camera bodies. With 20 optical elements, arranged in 15 groups, the IS lens is a more complex design internally. 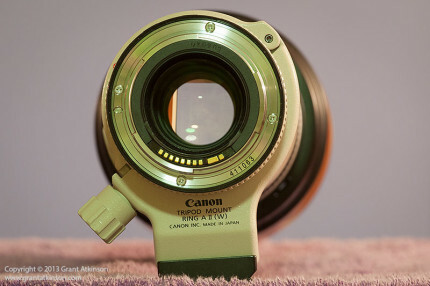 Canon were able to keep the same dimensions for the lens barrel, despite the addition of the image stabilization unit and extra elements. There are two UD (Ultra Low Dispersion) and one fluorite lens element. The flourite element improves image quality and weighs less than some other optics. Flourite and UD elements are highly effective at combating chromatic aberrations amongst other things. Both of these materials are more costly than regular optic materials. Although the EF70-200f4 L IS weighs 55g more than it’s non-IS stablemate, it remains a very light lens, at only 760g. The light weight makes it completely effortless to use this lens, and if you use it on a 1D series body, you would almost think there was no lens mounted. It balances very well with Canon Rebel/T4i/T5i/700D bodies, and equally so with mid-range dslr bodies like the 50D/60D series and the 6D/7D/5D lines. The lens is light enough that it won’t make you tired, and you can move it quickly and easily, when tracking subjects that move around a lot. It is much, much lighter than the top-of- the-range Canon EF 70-200 f2.8 IS L ii and because of that, provides a much easier shooting experience. Ease of use is so good with the EF 70-200 f4 L IS that it is my lens of choice for pelagic boat trips when the sea is rough, and I have only one hand free for photography because the other hand is holding the railing and keeping me upright! The zoom ring is wide, and situated close toward the rear of the lens. It turns smoothly and is well-damped. It takes so little effort to move the zoom ring that I am able to comfortably rotate it with just the top of my left thumb whilst supporting the lens with my left hand. As stated earlier, this lens is sold without a tripod collar, and you will have to buy Tripod Mount Ring AII(W) if you wish to mount the lens on a tripod directly. I sometimes need to shoot my 70-200 lenses on tripods, for landscape work, and also for product shooting, so I bought the tripod collar. The foot on the bottom also acts as a place for me to support the lens whenI am handholding, keeping my hand from bumping the zoom or focus ring accidentally. I usually mount a Really Right Stuff lens plate on all my lens mounts. It makes the lens foot longer and easier to grip when lifting the lens this way, and it also makes a good place for me to hold onto and support the lens when I am handholding. 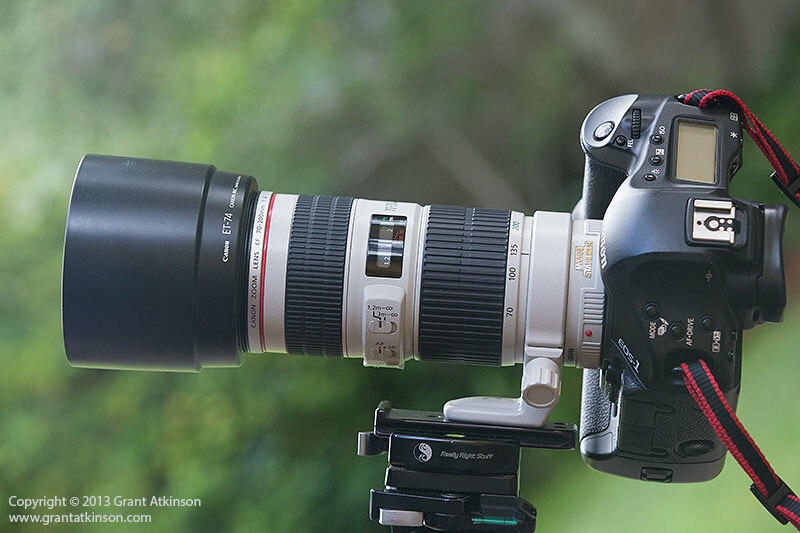 The lens plate makes attaching and detaching the lens from my tripod mount fast and easy. Using this lens with a tripod mount on the lens itself gives a very balanced feeling to the setup, as opposed to mounting one’s camera body onto the tripod and having the lens dangle off the front of the camera body. That can work with shorter lenses but although the 70-200 f4 L IS is light, it is a little too long to be used like that. Most of the time I use this lens in handholding situations. 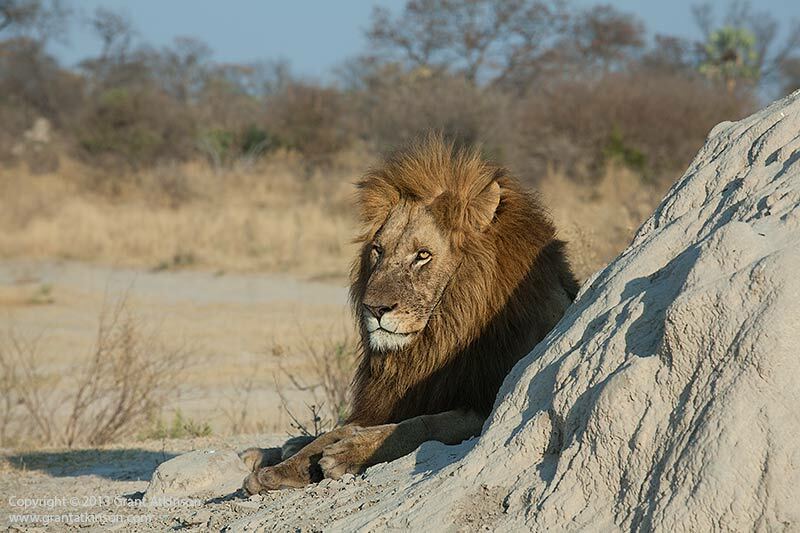 It’s compact size and light weight make it an ideal zoom lens to have for wildlife photography. Whilst 200mm is not nearly enough focal length for bird photography, it works very well for mammals. 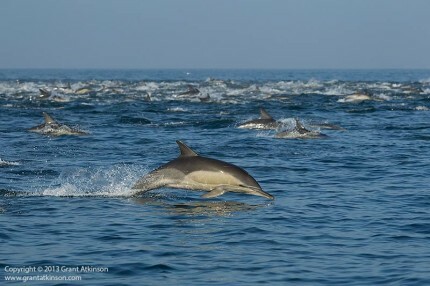 The shorter half of the zoom range also allows me to capture images of animals in their habitats. 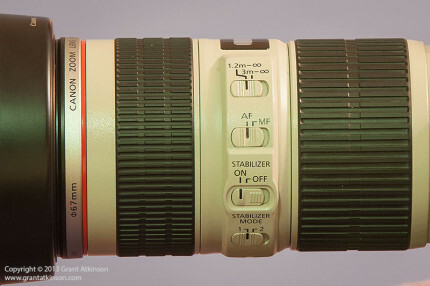 The EF 70-200 L f4 IS was one of the first white L-series Canon lenses to be fitted with an image stabilization system effective to four stops of shutter speed. What that means to the user is that the IS in this lens will dramatically improve the chances of taking sharp images at lower shutter speeds than before. In use the image stabilization system is quiet and fast. Mode 1 is best for general handholding, whilst Mode 2 is best suited to panning, which would include tripod use. If you are going to be shooting from a tripod at very slow shutter speeds, for instance in very low light, then it may be best to turn IS off. Autofocus is one of this lens’ strong points. The initial pick-up of subjects, even moving ones, is very fast. Also, because this lens has only a moderate maximum focal length of 200mm, it is easy to see where your subject is, even if the subject is still not yet focused in the viewfinder. That is helpful in keeping an autofocus sensor point on the subject. This can be much harder to do with very long focal length lenses. Another factor aiding fast autofocus response is the compact size of this f4 aperture lens. With lighter elements, and a shorter distance to move them, autofocus is instantaneous. In fact, I find that the f4 L IS gives up very little to the newer and more expensive EF 70-200 f2.8 L IS ii in this regard. Autofocus and image stabilization performance are both fast and near-silent. On most of my photographic safaris, I will travel with either this lens or the f2.8 version, mounted on one camera body, with my fixed 300 f2.8 on another body, alongside. 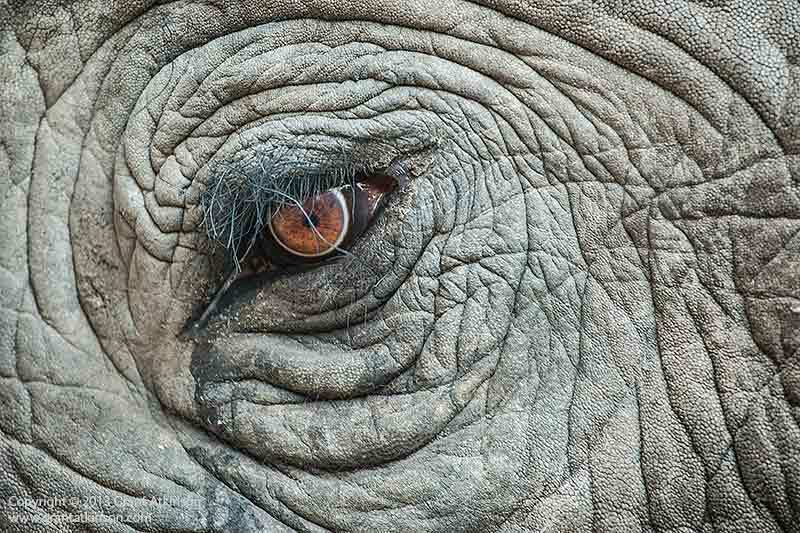 Compared to a fixed lens, there are lots of advantages to using a zoom lens for wildlife photography, not least that you are able to constantly adjust focal length if your subject changes it’s distance from you which happens often. With the 70-200 on one body, I am always ready for an unexpectedly close approach. Whenever I am shooting in situations where a subject may approach very closely, I make sure to keep the distance limit switch set on its minimum focus distance, which is 1.2m to infinity on this lens. This can slow down absolute AF speed, but the EF 70-200 L f4 IS is already so fast at AF that I prefer to be as prepared as I can be for that unexpected close approach. I used the EF 70-200 f4 L IS on a variety of Canon camera bodies, with different sensor sizes. On the Canon 7D with it’s APS-C sized sensor, the field of view is roughly equivalent to 112-320mm. This pairing combined the light weight of both lens and body, with good autofocus and decent resolution, and made for a powerful, close-range wildlife setup. On the Canon 1Dmk3 and Canon 1Dmk4, both of which have APS-H sized sensors, the field of view is roughly equivalent to 91-260mm. Autofocus was blazing fast and both of these bodies worked well for action photography on this lens. I also used the lens a lot on both the Canon 5Dmk2 and 5Dmk3 bodies, with their full-frame sensors. The wide-end of the focal length range, 70mm, was noticeably wider and more useful for capturing surroundings and environments on the full-frame bodies than with any of the other Canon cameras with smaller sensors (APS-C and APS-H). With the fine image quality and high-resolution found on both of these sensors, these combinations also produced lots of sharp images that were able to be cropped quite heavily without losing much quality if needed. The constant f4 aperture at all focal lengths is a strong point. In low light, f4 is better at gathering light than a lens with a maximum aperture of f5.6, but not as good as one that opens to f2.8. Improvements in low light capabilities of modern sensors may be reducing this advantage somewhat, depending on your own needs. This lens will work quite well with the EF 1.4x iii extender attached. The combination effectively creates a 98-280mm f5.6 maximum aperture lens. Autofocus may slow down just a little, and absolute pixel level sharpness may also be slightly affected. In my experience, I get the best results out of lens and extender combinations when pairing them with Canon’s 1D bodies and also the Canon 5Dmk3. Although it is possible to mount a 2x extender on this lens, it is not something I would recommend. Autofocus may only work with certain Canon bodies, and the viewfinder will be so dark as to impact the experience. There are better ways to get to 400mm of focal length. I always shoot in RAW and process my images in Adobe Camera Raw, which is very similar to Lightroom, and Adobe Photoshop. My evaluation of this lens’ performance with regard to image quality is based upon that workflow. This is a zoom lens that has excellent image quality even at wide-open aperture settings. I do not stop down the EF 70-200L f4 IS for sharpness when I am shooting. I choose my aperture setting based on creative reasons…depth of field and background blur being most important of those, and if I feel that I need to shoot at f4 for a shallower depth of field, I do just that, confident that the resulting images will be more than sharp enough for my needs. This is not to say that stopping down the lens to f5.6 or 6.3 won’t make it even sharper, but sharpness at f4 is easily good enough for my needs, which would be magazine-sized prints, fine-art prints and of course, internet usage. 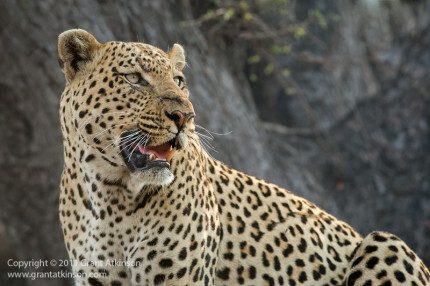 Male leopard. 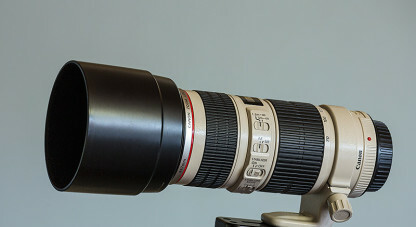 Canon EF 70-200 f4 L IS and Canon 1Dmk3. Shutter speed 1/320sec at f7.1, Iso 800. Cropped from 10megapixels to 1.1 megapixels. 100 percent view. Click for larger view. 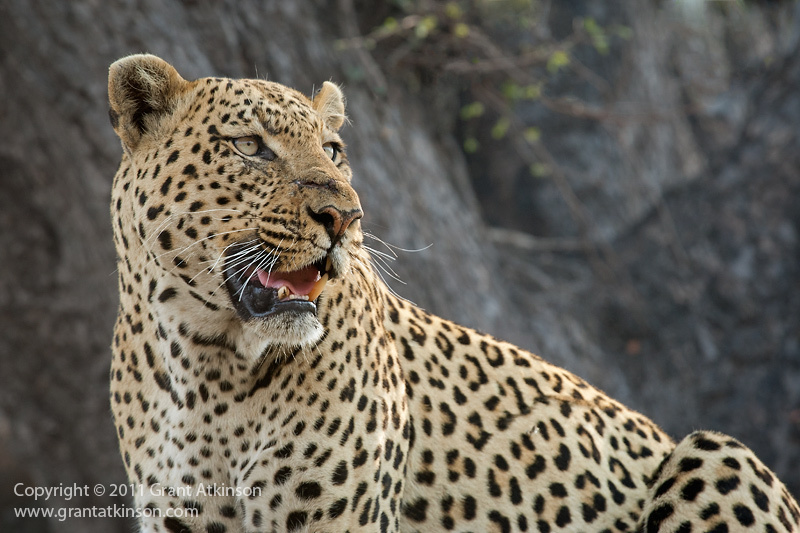 The leopard image above serves as a real world example of lens sharpness. I cropped the original image from 10.1 megapixels to just 1.1 megapixels, to show fine detail captured by the lens. I shot at f7.1 in order to get more than just the eyes in focus. Examining the image shows that eyes and nose, lips and teeth are all very sharp and detailed. Those parts of the whiskers that project closest toward the lens are slightly soft due to depth of field. I was unusually close to the cat for this image, but it can be seen that the lens does not suffer from any sharpness issues. When you use a zoom lens on a full-frame sensor, it is not unusual for there to be some evidence of vignetting around the edges of the frame. I photographed four images of the blue sky (please ignore the small clouds in two of the frames) at 70mm and again at 200mm, at different aperture settings. 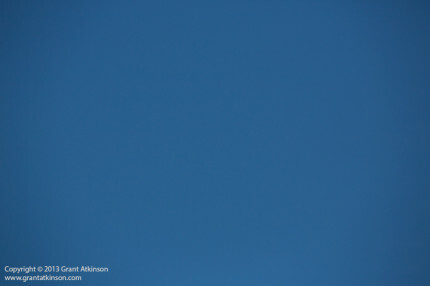 As can be seen from the images that follow, vignetting is more pronounced at 200mm and f4 than any other settings. Stopping down to f6.3 reduces the vignetting significantly. At 70mm and f4 there is less vignetting but it is still there, and stopping down to 6.3 completely eliminates it. I purposefully photographed a blue sky in bright conditions with an open aperture to illustrate what little vignetting there is. In real-world use I hardly ever bother about vignetting showing up in my images. Even if it does, slight vignetting can actually help draw attention to my subjects which are usually not positioned anywhere right against the edges of the frame. It is also very simple to get rid of slight vignetting such as this using Adobe Lightroom or Adobe Camera Raw and Photoshop. Canon’s software, Digital Photo Professional also takes care of it, and if you like shooting jpg’s, then many Canon dslr’s will also deal with it in-camera. If you shoot the EF 70-200 f4 L IS on an APS-C sensor camera like the Canon 700D or Canon 7D, you will not see any vignetting, as only the central portion of the image is captured on those sensors. With a maximum aperture of f4, the EF 70-200 f4 L IS can blur backgrounds quite effectively, although one does need to be relatively close to the subject for best results. 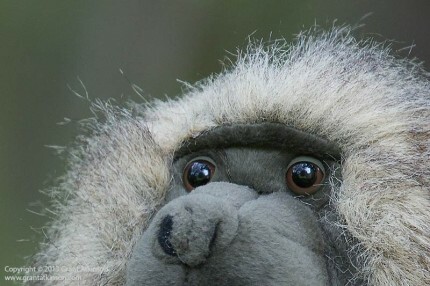 The image above illustrates what background blur looks like with the lens at 200mm of focal length and wide open at f4. The next image is composed similarly, but taken with a Canon EF 70-200 f2.8 L IS ii to show the difference between f4 and f2.8 apertures. The image above was shot from the same location, but with the Canon EF 70-200 f2.8 L IS ii wide open at f2.8, also at 200mm. The difference can be seen in the nature of the background blur, between the two lenses. When it comes to blurring backgrounds the extra f-stop of the f2.8 lens definitely allows more complete blurring of the edges and structure of the vegetation behind the subject toy baboon. Background blur also needs to be balanced against detail in the subject. In this instance, although shooting at f2.8 creates a more pleasing background, it also results in a less detailed subject, as those parts of the baboon that are not on the same focal plane as the eyes, are not in focus. I did not notice evidence of excessive chromatic aberration, even when shooting in very harsh light and with scenes that had high contrast. I have never had to do any removal of chromatic aberrations in processing on images taken with this lens so far. Flare happens when stray light gets reflected off surfaces inside the lens and either shows up in the image as small, circular, bright patches or even sometimes as large areas of low contrast. This lens doesn’t appear to be particularly susceptible to excessive flare effects, though aiming it at a subject with the sun’s direct and unobstructed rays coming into the viewfinder will cause images to lose contrast and may also make accurate autofocus more difficult to get right. I used to own and shoot with the earlier Canon EF 70-200 f2.8 IS i (version 1) and that lens was much worse when shooting toward the sun than the EF 70-200 f4 L IS, being a much older design. The 70-200 focal length range has appeal to a very broad range of photographers. Aside from nature photography, it makes for a great all-round lens for family and fun photos, and is also excellent for kids and pet photography, and some application for portraiture, specially on a full-frame sensor. It is also a great range for sports where the action isn’t too far away from the sidelines and many great landscape images are also taken with such lenses. It should come as no surprize then to realize that Canon currently offer three 70-200 lenses in their line-up. They are the EF 70-200 L f4, the EF 70-200 L f4 IS and the EF 70-200 L f2.8 IS ii. Which one is right for you will depend on your needs. The EF 70-200 L f4 is the oldest design of the three, the lightest in weight, and also the cheapest, by some margin. It offers image quality and autofocus almost as good as the more expensive IS version. It makes do without weather-sealing, and it has no image stabilization. 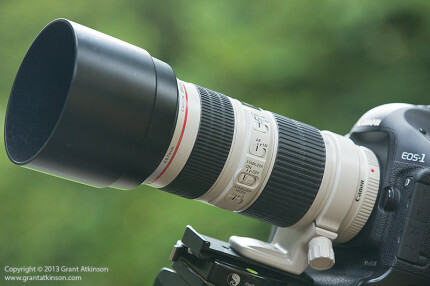 The EF 70-200 L f4 IS, the lens under review here, offers great image quality, great autofocus performance, light weight, weather-sealing and image stabilization and is priced in between the other two lenses I have mentioned here. It does almost everything that the much more costly f2.8 version can do, at around half the price. The EF 70-200 f2.8 L IS ii offers the very best image quality, the best autofocus performance of the bunch. It too has weather-sealing and 4-stop image stabilization. It also has the best low-light performance due to its bigger maximum aperture of f2.8. If you need that extra stop of light for indoor shooting, or the extra background blur that the f2.8 aperture can provide, then this is the best choice. It is much heavier than the other lenses mentioned here and twice the price of the EF 70-200 f4 L IS. Another lens to consider here is the EF 70-300 L f4-f5.6 IS. This lens matches the EF 70-200 L f4 IS at 70mm in its maximum aperture of f4. At 200mm it is at f5 though, compared to the constant f4 aperture of the shorter lens. The EF 70-300 L f4-5.6 IS does have similar IS, is weather sealed and comes close in terms of sharpness and AF speed. It’s biggest advantage may be its 300mm maximum focal length. It is also a little heavier. At the time of writing, third party lens makers Tokina are about to release an image-stabilized 70-200 f4 lens which will add yet more variety to the choices. The EF 70-200 f4 L IS is a fully-featured zoom lens that comes packaged in a surprizingly compact and lightweight design. With image quality almost on par with that of the best prime lenses, fast and accurate autofocus, high-quality construction and effective image stabilization , it is both a rewarding and fun piece of gear to use. Although not inexpensive, it offers excellent performance and real value for the price. Great review. I am curious, I am looking at the f4 which I’ve read is noticeably lighter than the f2.8. Given that the Canon Ring Mount is almost $150, how comfortable would you be foregoing the ring mount and hanging the lens off of the body itself? Thank you for the review Grant. Did buy one now and hope to make use of all this good features,specially the wheight and IQ of the lens. I bought this lens for my 5DIII and was a bit gobsmacked. (That is a good thing). Crazy sharp, even handheld! I finally dumped all my consumer gear and made the leap (it was a very-big-leap, since it was all film and not digital) because I knew my IQ was limited by the gear and not by my abilities. In other words, I had far outgrown my gear, and I’m not one to waste time wading through the shallow end of the pool. Just jumped right into the deep end. Now, when I miss an image, I ask, “what did I do wrong?” I know for a fact, if it isn’t tack sharp and perfectly exposed, it was all me. It has really pushed me along, and I look forward to growing, and this lens is an affordable ticket for that exciting ride. Now the song Crazy Train is stuck in my head. Dang it Ozzy! My desktop has a photo of a bumble bee on a flower, cropped and enlarged (27″ iMac) that I shot hand held, with a 6mm extension tube, IS 1. It was the third frame I had shot with my new camera and lens. I just wanted to see if the extension would work since it was a 12 year old Canon tube. I see this incredibly sharp image with wonderful bokeh everyday, and it reminds me, it is no longer the arrow, it’s the indian. It was the sharpest image I had ever shot up to that point, short of some 4×5 view camera stuff, but that doesn’t count for this. Thanks Grant! Now it is time to really get the autofocus thing into my wheel house. I’m experimenting with the info from your Back Button Focus article. Anymore articles or references would certainly be appreciated! Thanks for the enthusiastic feedback Dennis. I find this lens and its f2.8 cousin so good that they are almost as good as the best primes..
First of great review, good images and more in depth info about Canon EF 70-200 f4 L IS. Loved your review of this fantastic lens. I needed a fast lens for smoothing indoor high school basketball games for my daughter. I borrowed a canon 70-200 f2.8, and didn’t want to give it back. I got the 70-200 f4, as it was less $$$ and lighter. Some say you need a f2.8 to shoot indoor sports, but I have shot in some poorly lit gyms, just upped the ISO and kept shooting. The results were excellent, with my canon 60D. Thanks again for the great review. If anyone is thinking about this lens, don’t think, get it!!!! And have fun. Just how much better would the Mark iii extender be than the mark ii or mark I version? Hi Michael, there are small, incremental image quality improvements between the Canon extender 1.4x version I, II and version III. These may be a little hard to notice in field conditions between the 1.4x version II and version III, but there are slight improvements, perhaps best appreciated when the EF 1.4 extender III is paired with one of the newest Canon version ii super tele lenses. There is a more noticeable improvement to image quality, particularly when shooting at wide-open apertures, between the EF 2x extender version III and the older version II. I don’t have much experience using the version 1 2x extender so cannot comment on that one. I am totally amazed and in love with the 500 II lens and use it freely with the 1.4x III. I need your advice as to weather I should sell the 100-400 L and 70-200 f/4 IS and get the 70-300 L? I love the 70-200 f/4IS as it is a fine lens but the 100-400 is an older design and since I got the 500 II I may not need it as much. Or should I get the 70-200 2.8 II? Please advice. HI Sanjeev, thanks for writing. Replacing the 70-200f4L IS and the 100-400L f5.6 IS with the EF 70-300L will benefit you in simplification, in that you can carry one lens that does most (but not all) of what those other two lenses do. If you do need to lighten your load, then it is a viable option. The 70-300L performance, when it comes to AF speed, accuracy and image quality, is better than the 100-400L although not quite as good as the EF 100-400L. You will also increase the focal length gap between 300mm and 500mm. I am not sure how important that is to you. Typically what I do when returning from photo trips, is just have a quick look in Lightroom or Adobe Bridge at what focal lengths I was shooting most…hence if I found that I was shooting the EF 70-300L at 300mm all the time, and still having to crop, then I might need the 100-400L. Or if I find that I am shooting the EF 70-300L between 70-200mm most often, then I would do better to take along the EF 70-200 f2.8 L IS ii. Doing that always helps me figure out which focal lengths are most important to me…..
Getting the 70-200f2.8L IS ii on its own will give you near prime-lens image quality, very fast AF but nothing extra in terms of focal length. If you don’t mind the extra hassle of changing extenders in the field, then it can also provide a kind of one lens solution when paired with the 1.4x and 2x extender, covering pretty much everything that your two current lenses do, with the benefit of its superior performance when not matched with an extender. Thank you for your reply Grant. Highly appreciated. I have been on two safaris to Kenya and Tanzania in 2012 and 2013. The first time I took two 7D’s and 70-200 f/4 IS and 100-400 L and the second time I took the 5D3, 7D and 500 II and the 70-200 f/4 IS. The IQ from the 70-200 f/4 IS is definitely better than the 100-400 but I did miss the flexibility of the 100-400 during my second visit. The IQ of the 500 II is in another league and most of my images were with that lens and the wider shots with the 70 200 f/4 IS. I am leaning more towards the 70-200 f/2.8 II after reading your comments due to its stellar IQ and low light ability. I am waiting for the rumored 100-400 as that would be nice. 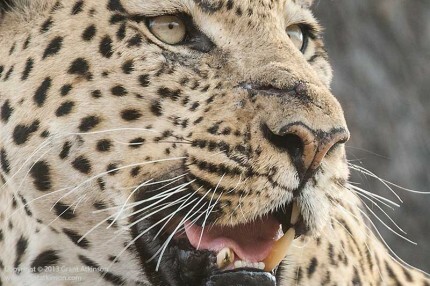 Some great, clean looking images in your gallery…favourites are the serval, the giraffe portrait. Also like the cheetah portraits and that very upright lappet-faced vulture. 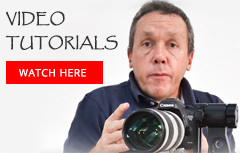 Nice work there, certainly looks like you are getting great image quality out of your gear. For sure the 70-200 f2.8L IS ii will deliver superior image quality….very close to that of the best prime lenses. Just so long as you have an extender to help close up the gap that may need filling between 200mm and 500mm. Thank you for your comments and appreciation of my photographs, am glad you took time to view them. I will wait for a couple of months to check if a new 100-400 is announced and then buy the new version OR 70-200 2.8 II if there is no news of it. I am quiet satisfied with my current gear, it is just that the 100-400 doesn’t have the 4 stop IS, weather seal and IQ that I am spoilt with with the 70-200 f/4 IS and 500 II. My worry is I may just miss that flexible range that it offers hence I am holding on to it as of now. Your review of the comparison between 100-400 vs 70-200+extenders says that the 70-200 II +2X III is better than 100-400. If that is true and if AF speed is OK then I would prefer that set up to fill the gap. It will be hard to let go of the f/4 IS, it is a gem of a lens. Hi Sanjeev, it can be quite difficult to choose between the wide range of lenses Canon has in the 70-400mm range…some of them compliment one another well, and others compete or overlap one another when it comesto performance and focal length range. Although the 70-200f2.8L IS ii definitely performs on par with the 100-400L when shooting static subjects with the 2x extender attached, it may not be superior for moving subjects when it comes to AF. I did not spend too much time evaluating moving subject performance between those two lenses. I do typically find that the 2x extender causes AF to slow down a lot, and also become more erratic in terms of locking-on, hence my own preference for the EF 70-300L when I need more focal length than the EF 70-200f2.8 can provide. 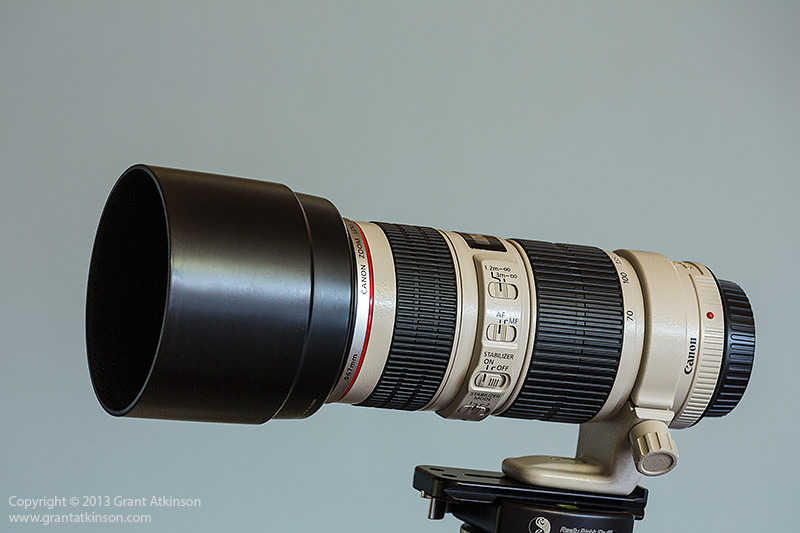 Adding an extender to the EF 70-200f2.8 makes it quite heavy, and bulky, especially the 2x. Between my wife and I, we own the EF 70-200f4L IS, the EF 70-200 f2.8L IS ii, the EF 70-300 f4/5.6L IS. Do we need all three? Who knows? Can we decide to do without any of these three….it would seem not, so we have kept all three :-), just because it is so difficult to give up any one of the three. I completely agree with you! I will adopt your setup 🙂 replace the f/4 IS with the 2.8 II & get the 70-300 L to replace my 100-400 as I have the 500 II. I guess this is the best option, the 2.8 for low light and best IQ and 70-300 L for flexibility and lightweight travel. Please help me out, I am planning to buy a telephoto zoom lens and bit confused which one to choose. Either 100-400 f4.5-5.6 or 70-200 f/4 IS. 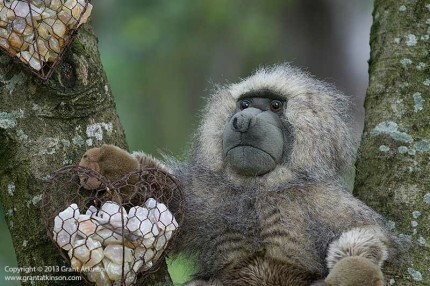 I am interested in birding and would like to pursue it seriuosly. I have EOS 7D and a beginner in the art of photography. Would be very glad if you can drop in some advice to choose the best. Although the EF 70-200 f4L IS is both a little sharper, and quicker to focus, of the two lenses you mention above, it is usually not enough focal length for any but the very largest of birds. Typically for birds, the longest focal length you can manage is almost never enough. Some of them are not easy to approach, and the longer focal length helps with that aspect. With that in mind, I would definitely choose the EF 100-400L f4.5-5.6IS as a very versatile lens that is just about long enough for some good bird photography. It will pair very well with your 7D body. Thanks a lot for your valuable tips. This being my first L series lens and just want to make sure i chose the best within my budget. I can stretch my budget max up to $2000 and buy something which can serve my birding purpose to the optimum level. Whether i should just go ahead with 100-400 mm or should i also evaluate 300 mm f/4 with 1.4x or 400 mm f/5.6. As this will be my first L series lens, I want to make sure that I explore all the options. What is your opinion on EF 300mm f/4 with 1.4 xII extender. I can stretch my budget up to $ 2500. Hi Manjoy, the EF 300 f4L IS is a very popular lens, and would make a good option instead of the 100-400L. When combined with the 1.4x extender, you have an extra 20mm of focal length, as well as image stabilization, plus the advantage of being able to take full benefit of the EF 300 f4L performance without the 1.4x extender if subjects are close enough. The EF 300f4L IS plus 1.4x extender makes an altogether more versatile combination than the EF 400 f5.6L due to the extra stop of aperture when used without extender, plus with its image stabilization. After reading your very clear review I have decided to buy this lens. The only question I have is if the combination between this lens and my Canon 30D is okay. Thanks in advance! Thanks for writing. The EF 70-200f4L IS will function perfectly well with a Canon EOS 30D. It will give you a field of view through the viewfinder roughly equivalent to 112-320mm. Autofocus should be fast, and the viewfinder should also be quite bright. The lens and EOS 30D will also work perfectly well if combined with an EF 1.4x extender. I have used the non-IS version of this lens for a long time with a Canon 30D myself and was very happy with the performance. Hi Grant, thanks very much for your swift reply! Much appreciated. I am going to South Africa this Christmas and wil also visit Marakele National Park for 5 days, hence the need for this lens. Would you recommend a certain type of fillter for the lens for my trip ? A circ pol? Hi Evert-Jan, as far as filters go on mid-range telephoto lenses, I might only use a clear filter or UV Haze filter, purely for physical protection if there is an excessive amount of dust, debris or perhaps salty moisture around near the ocean. The best image quality that can be obtained from the lens comes when it has no filter mounted….and it has a nice, deep lens hood to help protect it. So in situations where there is not too much dust or moisture around, I will remove any protective filter I might have in order to maximize image quality. If there is a little dust around, I am happy to just keep the lens hood on, and clean the front element at the end of each day. If I am on a boat on the ocean, with salt spray, then I keep the UV Haze filter on just to keep the corrosive air off and out of the front element. I remove all filters when shooting over freshwater, and where there is no airborne spray around. Hi Grant, Thanks again for your advise on this! Much appreciated. I am all set now. I think there are a number of factors to take into account when making your choice between the Tamron 70-200 f2.8 VC and a Canon EF 70-200 f4 L.
Only you will know how important it is for you to have the advantages that the extra f-stop of the Tamron are for your shooting needs. Will you be needing the extra background blur capability of the f2.8 lens for your photo models? Will you need the extra stop of light for shooting in extreme low light? Those are both advantages of a f2.8 lens over an f4 lens. On the other hand, if a maximum aperture of f4 is wide enough for your shooting needs when it comes to depth of field, and you wouldn’t normally be shooting at f2.8 anyway, then the Canon is a good option. It would be my expectation that the Canon 70-200f4L IS, being an L-series lens, should perhaps last longer and be less likely to wear out in heavy, everyday usage. I am also more confident of quality control on new Canon lenses than I am on third party manufacturers products. Although I have not used that particular Tamron, I am led to believe that it produces good image quality, and in this aspect is similar to the Canon EF 70-200f4 L IS. I don’t think that image quality would be a decider between them. Great review very helpful. I am going on a safari this year and need some help. I currently have a 60D which I plan to use as a second body. I am looking to either get a 70D or 7D mkii(if it ever comes out) or maybe a 6D although the AF and FPS doesn’t seem ideal for wildlife. I currently have a 15-85 and 100-400. I was thinking of getting a 70-200 f2.8 mkii or 70-200 f4 is for dusk and dawn drives. What do you think the most logical combo of new primary camera and lenses would be? If it were me I would probably get the 70D, it offers many advantages over your current 60D when it comes to wildlife photography. 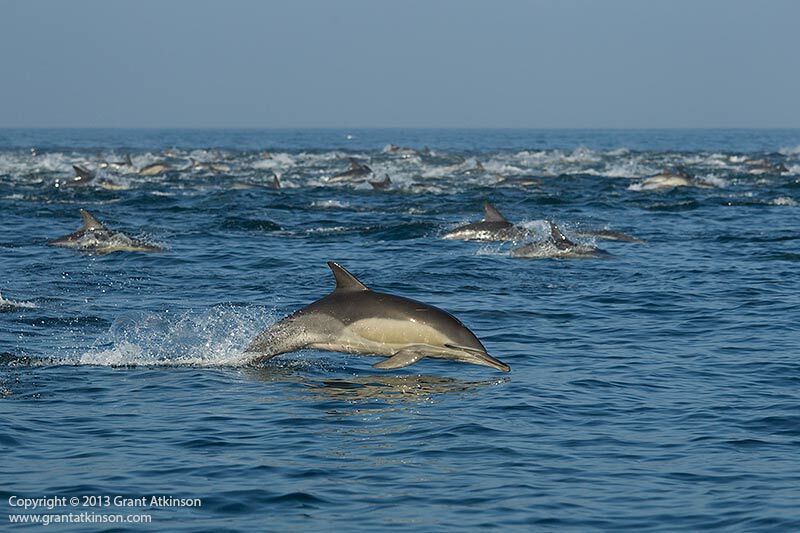 Autofocus accuracy, AF point coverage, improved image quality at higher iso, faster frame rate are all serious advantages for wildlife photography users. The quick-focusing Live view and the swivel screen are also useful at times. If you are going to then have the pair of crop bodies, 60D and 70D, I would get the EF 70-200f2.8LIS ii for its low light capability. It will give you great low light capability. Another alternative might be to sell the 60D, and replace that with a 6D. Having a 6D and 70D combination would give you more options, especially when the light got low, switching to the 6D would be almost as good as having a lens with faster maximum apertures….it would boost your 100-400L performance in low light very well. 6D, 70D, EF-S15-85, 100-400L a decent safari setup, and with the inclusion of 6D that may open up more choice between 70-200f4L IS or 70-200f2.8L ISii, as using Canon’s new full-frame sensor bodies with their great high iso performance and low light AF capability means that f4 aperture lenses become more powerful tools for low light. Thanks Grant! I just got the 60D and like it (used to use an XTI). Because there are not too many times I will truly need two bodies, I think upgrading to a 6D and selling the 60D would be fiscally irresponsible. I think the 70D with the f2.8 70-200 mkii will make the most sense long term for me of the options you discussed. I think it’s a fair statement to say a lens will outlast a body, so I think for now I will take your advice and go with the f2.8 and down the road if I decide to replace the 60D I’ll still have the lens. Hi Eric, I hear what you are saying about the bodies. The 70D will be a big step forward on its own. Whenever I am choosing what equipment to buy for wildlife photography, I always try to spend my money in ways that will allow me to expand my shooting capabilities, whether that be AF speed, image quality, high iso or low light…and your choice of the EF 70-200f2.8L IS ii will be an advantage for you in all of those aspects. Thanks again for your time and advice Grant! Just to keep you informed (since I have written to you on this thread earlier) I have sold my 100-400 L and have placed an order for the 70-200 f/2.8 II lens and plan to use it with the 1.4 X III and 2X III extenders. I have the 500 II L lens and these two will be my primary wildlife and birding set up on a 7D and 5D3. Hope this kit will serve me well. BTW, when can we read your review of the new 500 II lens?? Hi Sanjeev, thanks for letting me know how things are working out. 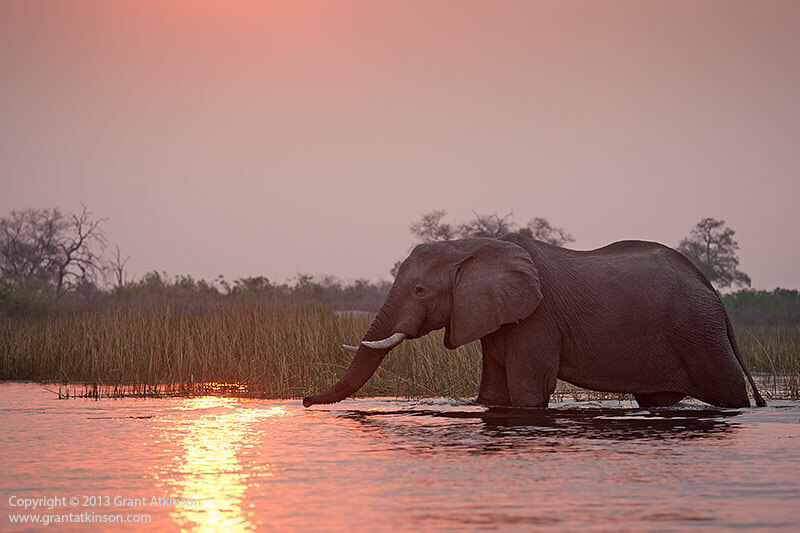 I am travelling myself for photo safaris still with the EF 500f4L IS ii, and then choosing between EF 70-200f2.8 L IS ii and the EF 70-300L f4/5.6, and finding it a very good combination, as we discussed earlier in this post. I think you will be impressed with the performance of the EF 70-200f2.8, when it comes to AF speed, accuracy and image quality, as well as its powerful low light capability. I am also finding that with the improved image quality of the 70D, that it adds an extra option of higher resolution in good light for far-off objects, along with my 5Dmk3 and then either the 1Dmk4 or 1DX. Any idea when a7D mkii might arrive? I’d hate to buy the 70D for the 7D mkii to come out 3 months later. I wish I could say I knew…Only what I have read on Canon Rumours :-). It does seem that there may be some expectation building for a February announcement from Canon, not sure exactly what will be announced though. Agreed Grant. I think it will likely come in between $1800-2000 since the current 7D is $1500. I think it will be priced right around the 6D pricing. which is the quality one, sir…… pls replay me sir…… pls pls sir watch one time my page sir https://www.facebook.com/DARCROOM you will be easily understand my problem sir…… pls help me to chose batter sir…. Thank you very much sir…… i hope sir, you can replay my question. You seem to already know most of the differences between the EF 70-200f4L IS and the EF 100-400L. The EF 70-200f3L IS produces sharper images, focuses a little faster, has a one stop low light advantage, newer more effective IS system, and is lighter. If you combine it with a 1.4x extender, it still performs quite well when it comes to image quality, but would then produce images quite similar to the 100-400L in sharpness. With the 1.4x extender in place it would no longer be superior to the EF 100-400L. It would also still give up 120mm of focal length to the longer lens. If you are photographing wildlife, especially birds or smaller animals, or you are working in places where you cannot get very close, then the EF 100-400L will have a big advantage with its extra 120mm. If you do choose the 70-200Lf4 IS, you will always be able to take full advantage of its performance when subjects were closer, and you used it without an extender. If you really want to get the 70-200f4L IS, you won’t be disappointed. It is an excellent lens, and will do a great job with the 1.4x extender. I have not actually tested the 70-200 plus the 1.4x extender, in the same place and same time, on the same subject as the Ef100-400L, so I cannot say for sure which one is sharper. Both are sharp enough to deliver publishing quality images though…. Hi…I would like to understand one small point. With my Canon 7d, can I take reasonably good wildlife picture with 70-200 f4L IS+1.4extender? Will it be effectively upto 448mm at f5.6 with reasonably good wildlife picture which is equivalent to 400mm result for canon 100-400? Hi Bedanja, if I understand your question correctly, you are asking whether the EF 70-200f4L IS plus 1.4x extender will perform as well as an EF 100-400 f4-5.6 IS lens at 400mm. Regardless of what camera sensor is behind the lens, what you are essentially comparing is the 200mm lens plus extender, which is 280mm, to the longer zoom lens at 400mm. If you cropped the image from the 280mm combination until the subject was the same size as the subject taken at 400mm, the image from the 100-400 would be superior. You would only really see a big difference at very heavy crops, more than 50 percent. You will get good results from a 7D and EF 70-200f4L IS plus 1.4x extender, but its image quality at 280mm will no longer be any better than the image quality of the EF 100-400L at 400mm.. Thank you! I was really depressed and ready to ditch my 70-200 F4 IS, but your detailed and very POSITIVE conclusions about the lens gave me another push to practice a bit more. Thanks again! I love this lens. I was torn between this and the 2.8, but ultimately I couldn’t convince myself to spend twice as much. Maybe sometime. Anyhow, this lens is sharp, AF is very fast, and its not really all that heavy. Very happy. I am travelling to kilimanjaro and Safari next year and I have recently bought a canon 70d, and a 70-200 f4 l lens with IS. The reason I chose this lens was mainly because of how light it was compared to other lenses and reasonably priced. Do you think I made a good choice? Should I opt to get an extender, if so which one; 1.2 or 2? Also this lens is most suited to zoom/telephoto, so if I was to consider another lens to take landscape and/or a general purpose lens which should I consider? Your advice is greatly appreciated to this novice user. Hi Ruby, I prefer to use the 1.4x extender, which degrades image quality less, and still allows quite fast autofocus performance. It will give you a maximum focal length of around 280mm at an aperture of f5.6. 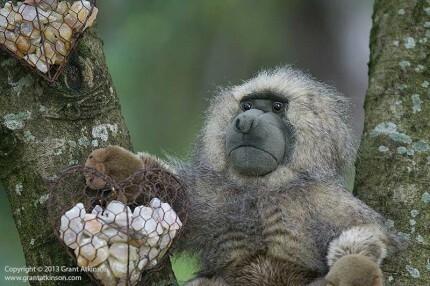 That will be most useful on safari. Avoid the 2x extender for an f4 lens, as it will make the viewfinder quite dark, and be very limiting with autofocus. Thanks for the review. I have wanted the 70-200 2.8is for a long time, but finally opted for the f4 version due to size and weight. I use that range for sports and portraits. I don’t need it for indoor use, though sometimes I need the extra stop of light if the day is overcast. Now that I have had it for about 4 months I am having some buyers remorse because it doesn’t seem to focus as quickly as the 2.8ii version. Any thoughts on this? Should I stay with the f4 lens, as it seems to be the better size for me? Hi Susan, I found the 70-200L f4 IS to focus quite fast, fast enough for me to have confidence to use for action photography. What camera body or bodies are you using it on? That might be a way to get faster autofocus, depending on what body you are using? The camera body will play a big role in how fast autofocus is, and the newer camera bodies will also allow you to raise the iso higher without too much image quality loss, when you have overcast days. If the 70-200L f2.8 Is ii does focus faster than the f4L IS version, that difference in speed is virtually imperceptible to me, but of course these things are subjective. The f2.8 version is significantly heavier, and wider, more bulky in most respects. Let me know which body or bodies you use the lens on? I just purchase the 7Dmk2, moving up from a t3i. I have the 70-200 F4L IS and love it but I feel short sometimes doing wildlife so I m looking at the 1.4xIII extender… the 2x might have too much cons. Might eventually change the F4 for F2.8 IS II for dusk and dawn light improvements (with 1.4x), but weight (and price!) was an issue when I bought the F4 so will test drive with the 7DmkII + 70-200 F4L IS + 1.4xIII first…. That is a reasonable setup to have, using the 1.4x iii on the 70-200Lf4 IS. For sure you will lose one stop, but 5.6 is still okay for a max f-stop most of the time. You may also find a slight drop in autofocus speed. This is likely to be least noticeable in bright light, and more so when the light gets low. However, the 7d2 will drive the 1.4x and 70-200Lf4 IS better than the t3i. You might also find a slight loss of sharpness with images taken with the extender. With some combinations of extender and lens I have found that stopping down one stop beyond the maximum, in this case, to f6.3, adds back some sharpness lost at the maximumum aperture. No other cons that I can think of with that combination, and whilst the extender option is always a bit fiddly because you have to mount it when needed, the plus is that in very low light or for close subjects, you can take it off and enjoy f4 performance again. It took me ages to choose between the 70-200 f/2.8L IS, the 70-300L f/4-5.6 IS, the 100-400L f/4.5-5.6 IS and the 70-200 f/4L IS. I eventually went for the 70-200 f/4 that you review here, and am very happy. It is simply superb. Hi Tom, these days Canon has such an array of really good mid-range telephoto zooms that there really isn’t a bad choice. It used to be easier to decide though, when there where fewer to choose from :-). My problem is coming in deciding which ones to hang onto, because I like several of them very much, but they overlap too much for me to keep them all. We have the 100-400L IS ii, the 70-300L f4-5.6 IS, the 70-200Lf2.8 IS ii and we can get our hands on our former 70-200Lf4 IS anytime we need it :-). At least my wife and I don’t have to fight over mid-range zooms when we are shooting together. This will be my first venture into digital! Moving from an old & trusted FujiSt901 with a 50mm 1.4 fujinon lense and trusted Ectachrome!!. I’m looking at a Canon EOS 5DSr and the EF70-200f4L IS lense(just read your review) to see if I can cope with ‘digital’? Must admit the body seems a bit expensive. Will I be ‘setting-off’ with a good starting pack? All good with the lens and dslr body you are starting off with. With regard to the 5DSR body, it is an extremely capable camera, and excels in some kinds of photography, and is still competent in others. It has excellent autofocus, good low light capability at output level, makes fantastic beautiful images and is relatively compact. Some folk do and some folk dont, struggle with getting pixel level sharpness when they are handholding this camera and any other camera with very small pixels – like the 7D, 7DMark 2, 700D, 70D, 60D. In that respect the 5Dmk3 is more forgiving, when compared to the cameras with finer pixel pitches. That would be something I would think anybody starting out with a fine pixel pitch camera body should be aware of. If you shoot in bright light, or with flash, or studio lights, then you may not even notice any difference, but if you shoot in low ambient light, then it can be more difficult to capture moving subject matter as sharp at pixel level. This is a confusing topic though and one prone to misunderstanding. I think it is a great combo though and should deliver beautiful images. 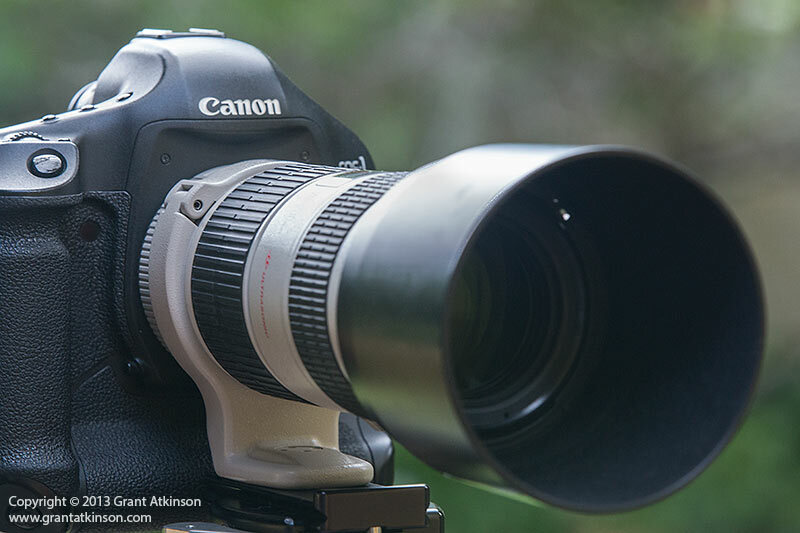 Your review of the 70-200mm f4 IS was simply amazing. I am now actually stuck between deciding whether to go for the IS or non IS version. I mostly do outdoor photography and sometimes have to shoot during dawn or dusk. I do not carry my tripod everytime. I have an 80D which is pretty good in low light and at higher ISOs. Can you please advise which would be the best option for me ? I will certainly consider your suggestion as the IS version packs in a lot more features than just the IS itself for the extra money. good day. i recently purchased this lens and used it in beijing in -11 centigrade weather and the lens seized up and would not work. i used it after in thailand and it was fine. i use a 7D body. what is the high and low temperature range for this lens? i have searched and couldnt find any information.